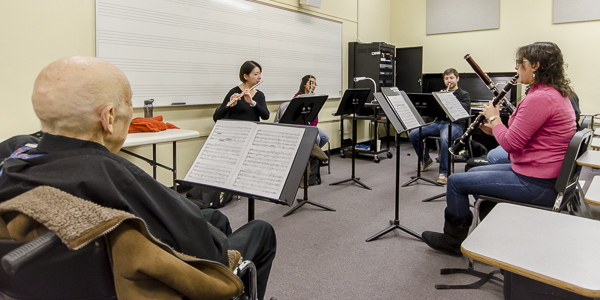 On Thursday, January 21, 2016, K. David Van Hoesen, former Professor of Bassoon and Chair of the Wind, Brass, and Percussion Department at the Eastman School of Music visited the Mary Pappert School of Music to work with the Triano Woodwind Quintet. Van Hoesen, father of harpist Gretchen Van Hoesen (Pittsburgh Symphony Orchestra Principal Harp and Mary Pappert School of Music faculty member), has also been Principal Bassoonist for the Rochester Philharmonic and a member of the Lake Placid Sinfonietta from 1947-2011, a tenure of 64 years. Van Hoesen's students hold positions in the symphonies of New York, Toronto, Washington D.C., San Francisco, Cleveland, Atlanta, Cincinnati, Dallas, Columbus, Charlotte, Baltimore, Denver, and Metropolitan Opera, to name a few, as well as in universities and colleges (Juilliard, Oberlin, Eastman, Cleveland Institute, etc.) and around the world. The Triano Woodwind Quintet is a graduate ensemble, coached by James Gorton (Mary Pappert School of Music faculty member and former Pittsburgh Symphony Co-Principal Oboist) that performs regularly in the Pittsburgh region, bringing attention to the Mary Pappert School of Music and its extremely talented students. Members of the quintet include Andrea Melissa Venegas Vargas (clarinet), Juan Antonio Rodriguez (bassoon), Xin Peng (flute), Matt Ashton (horn), and Juliana Lopez (oboe). Van Hoesen sat in on Triano's rehearsal last Thursday, stopping the group every few bars to work with each player individually, as well as with the ensemble as a whole. 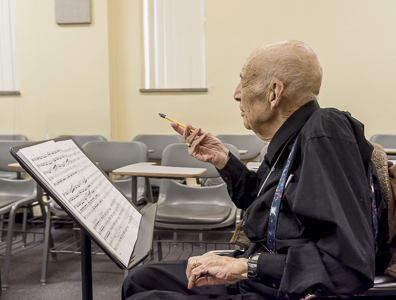 His years of experience as both a professional performer and educator enabled him to bring a very high level of detail and nuance to the music the group was rehearsing. James Houlik, Professor of Saxophone and Chair of Performance said, "David is a remarkable repository of information and a master teacher that brings many years of experience to our students - something they can't get anywhere else. It's not just a wonderful experience for our students, either. It's a pleasure for anyone, student or professional, to watch Mr. Van Hoesen come alive when he hears music and reengages with his lifetime passion."